"Self, Good Day. ": warning: this is that post you probably hate. warning: this is that post you probably hate. because it's one of those posts where I just tell you what has been going on lately as opposed to blogging about an actual event. any.hhhway. this past month has been a little cray cray. sometimes school owns me. but i'm making it. I've made it through the first round of midterms and found out that most of my classes understand that "midterm" means middle of the term so that means no more tests in those classes until the final! yeah! okay! but even though that sounds pretty neat, i know i still have 74 papers to write and four MILLION pages of reading, so that's just neat. but it's all good. another thing, work is pretty neat. I consistently hit twenty hours a week earlier than I think i'm going to, so there's that. except for the fact that i have things I need to get done so it's actually kind of annoying. it's like i'm an important person or something or have a real job. anyway, as usual, obsessed with both my jobs and i'm already starting to struggle with the fact that i only have six more months of working at both of them. ew, that just made me really sad. i've been being cultural and stuff lately. I went to the Latino Cultural Night up at the conference center because my main girl Caroliiiiiina was in it! It was srsly so cool! I went with my friend Kelsey and we had a b-l-a-s-t (which, by the way, is not an extended BLT with avacado and salami...which is pretty much what Rach thought it meant when I spelled out that word for her the other day, so nbd). I also went to H&M, which I feel is very cultural in and of itself and then I went to OATS. no idea what that is? neither did I when I was talking to this cute old lady in salt lake. She was like, "Oh, did you guys go to oats?" and I'm like, is that a restaurant because is sounds one MILLION lame, not a joke. But no, it actually stands for Orchestra at Temple Square, and yes that actually is where I was. Classical music, bay bay. You know it's my thing. It was actually quite pleasant and I mostly kind of napped through it and by napped I mean I listened very closely with my eyes closed. No, but really. It was quite nice and I'm like, srsly. Why did my mom not put my in oboe lessons, because I just KNOW I would have been a prodigy. Oh, also. That night we also went to Chick-fil-a, another cultural experience. Talk about a cultural weekend! Rachy Rach is almost 7 months pregnant! I'm so glad this made it to my list of important events that have happened lately. Rach and I have lunch every Friday and can I just say it's like my favorite thing? Not a joke, that girl. She is just my favorite. Every week is a riot. For example, this last Friday I was buying a brownie in the bookstore (judge me), and as I was paying for it, she calls to me from the candy aisle saying, "Mom! Mom! You forgot to buy me this candy bar! Mom!" I started laughing and the cashier was like, "What?" and I was like, "look at her, doesn't she look ridiculous?" He didn't find it quite as amusing as I did, but whatever. His loss. Also, I have a public service announcement: random people who touch the bellies of pregnant women for extended periods of time make everyone uncomfortable. I just wanted to get that out there. Danielle is a faaaaaabulous roommate/mom as she has been making me dinner quite regularly. I mean, really. All I have to do is request a meal and she'll make it. See, watch this: Danielle, I would like you to make me that broccoli chicken casserole. (I hope she sees this). She's like the magical dinner-making magician. I just used two variations of the world magic in there and ID even C (i don't even care). also, I've really struggled with capitalization in this post. sorry not sorry. oh, and we bake. and by we, I sometimes mostly mean Danielle, but still. I made these yesterday (with Danielle's help, of course) and they were quite fabulous. 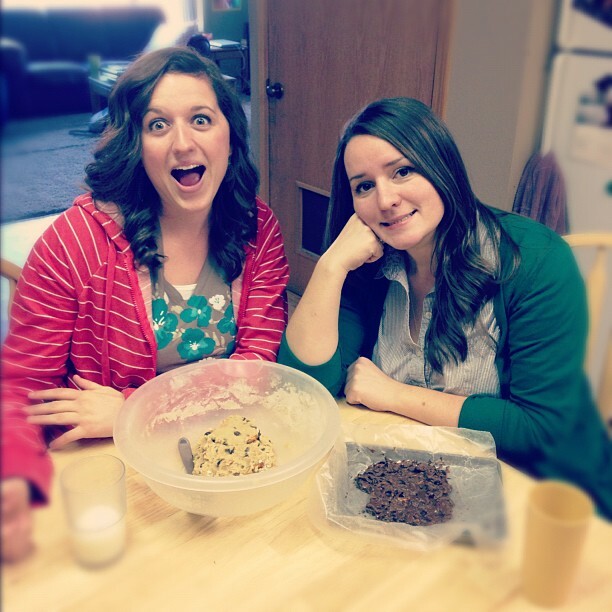 then today (seen in the picture above in which I look totes cray and Allison looks especially jazzed) we made cookies and some wild chocolate delight (WHILE we were still fasting, so take that). srsly though, sometimes I wonder how I don't weigh one MILLION pounds with all this stuff danielle makes.